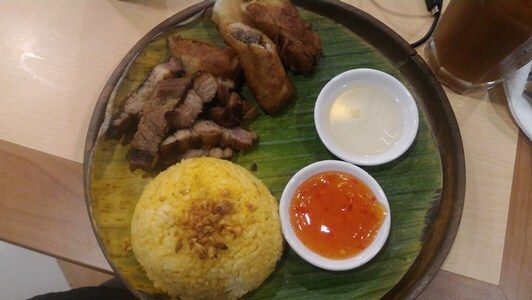 My son and I have always enjoyed the pork barbecue that’s always served to us when he and his classmates would have group meetings/practices at Bacolod Chicken Inasal (BCI) in Greenhills, San Juan. First, the venue is near their school, and second, the owners of this Pinoy restaurant were my co-parents at La Salle Green Hills. The ever-generous Tanalgos would always welcome us (their co-parents) and our boys (their younger son’s friends and classmates) to their home and to BCI in San Juan, which is an extension of their lovely home. Last April after Justin’s playtime at Timezone SM Megamall with his LSGH friends and classmates, we waited for his Dad outside BCI. Since it was already past 6:00 p.m., we decided to just have dinner there before going home. The first thing we noticed was that the staff were very welcoming and courteous. It didn’t take us long to decide what to order because at first glance on their menu, we already knew what we wanted. We tried their two “Sarap Meals”, their Porquito Trio and some desserts. Hubby ordered the Sarap ng Buhay Meal which has Inasal na Petso or Paa, Eggplant Salad, Garlic Rice, Buko Pandan and 16 oz. Nestea House Blend Iced Tea. Between the two of us, hubby likes Chicken Inasal more than I do. I didn’t bother touching his plate because from the way he was enjoying his meal, I didn’t think he was open to sharing it with anyone. Lol! 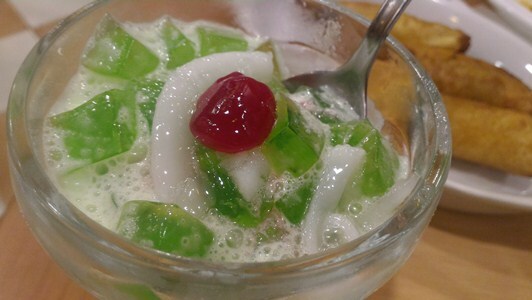 It was simot-sarap! The Buhay na Buhay Meal was mine. 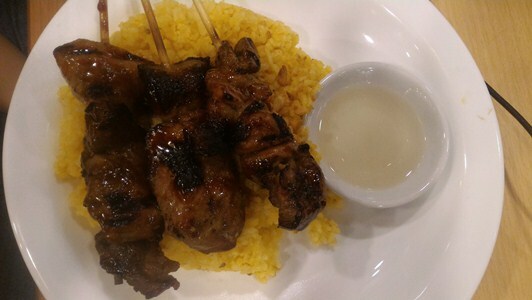 It had Grilled Pork Spareribs, 2 pcs. of Bangus Lumpia ni Mom, Garlic Rice, Buko Pandan and 16 oz. Iced Tea. I love anything bangus, hence this choice of meal. But you know what, I enjoyed the Grilled Pork Spareribs just as much because it was tender and really flavorful. I actually ate more of it than the bangus lumpia. Quite naturally, Justin would look forward to having BCI’s pork barbecue, so we ordered Porquito Trio for him. It consists of 3 sticks of Porquito with Garlic Rice and 12 oz. Nestea House Blend. As expected, he ate the pork barbeque with gusto. Despite already having Buko Pandan as part of my set meal, I still ordered Turon (Regular) because it’s also one of their food offerings that I love. 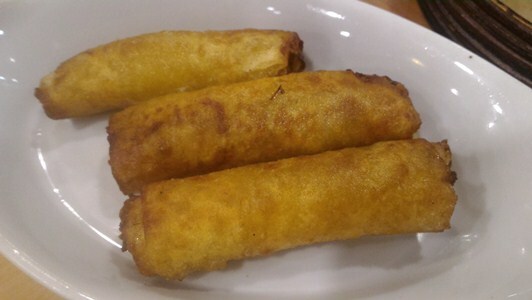 They’re smaller than the usual turon which I like as it gives you the feeling that you’re not eating too much of it. Lol! They’re oh so crunchy and yes, they have sweet langka (jackfruit) inside, too, which makes me giddy with excitement! Turon with ice cream? No problem! They also have Turon Ala Mode. 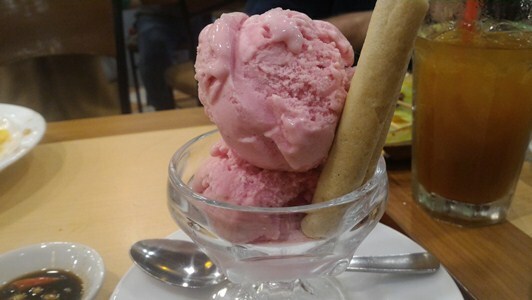 Justin had Nestle Ice Ice Cream with Barquillos. He loved this strawberry-flavored ice cream. I think it’s also the first time he’s had Barquillos, and he said it’s fine. Because hubby and I ordered extra rice, our bill totaled to a little more than Php800 which was quite affordable, considering that we ordered quite a lot. We also like the fact that there’s lot of food choices on their menu. On our next visit, I’d like to try their Mahabang Buhay Meal and Lutik. 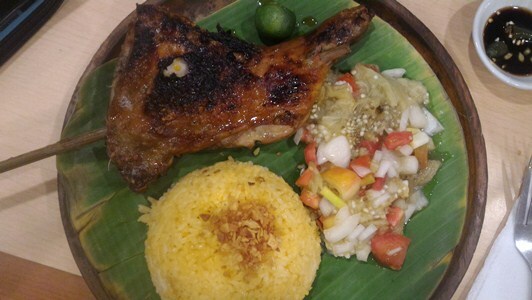 This entry was posted in Bacolod Chicken Inasal, Filipino Cuisine, Ilonggo Cuisine, SM Megamall. Bookmark the permalink.